Nobody creates zombie portraits like Horrify Me. 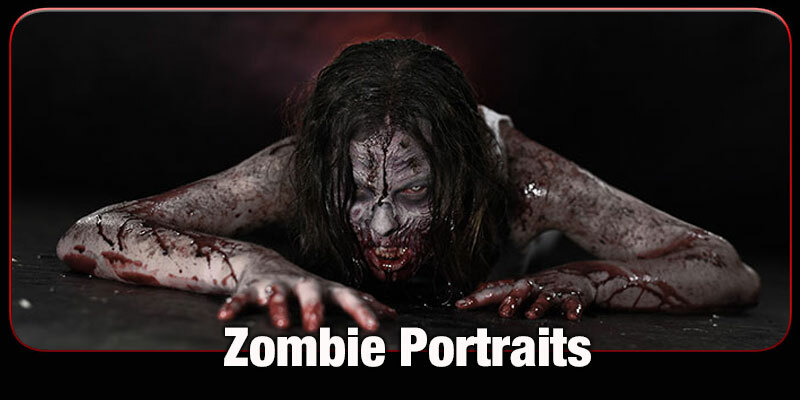 We transform you fully, from head to toe, using professional makeup, loads of fake blood, and sinister horror movie lighting techniques to generate the best zombie portraits on the market! 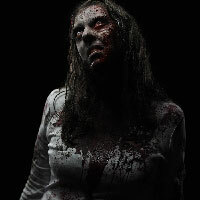 • In this dramatic photoshoot, you will be transformed fully into the living dead. 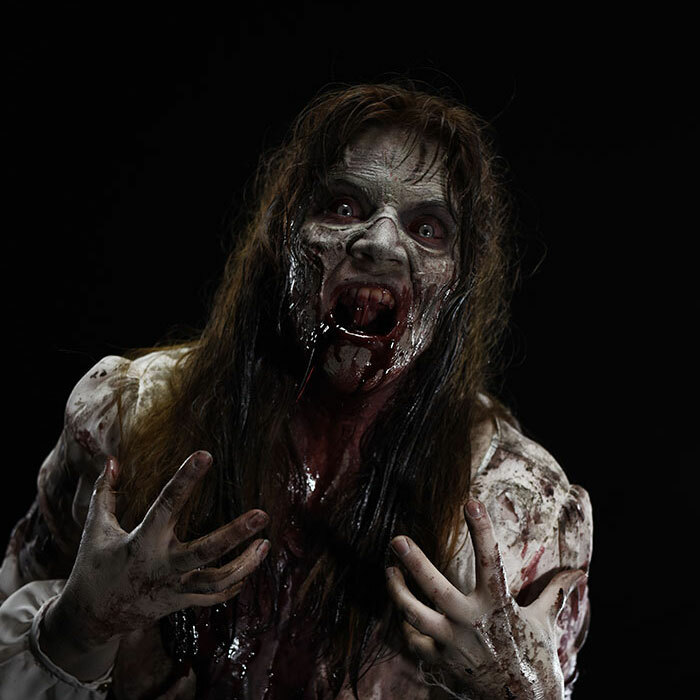 The transformation is very thorough, from head-to-toe, and includes torn and filthy clothes, grime all over your body and hair, and of course terrifying zombie face make-up. 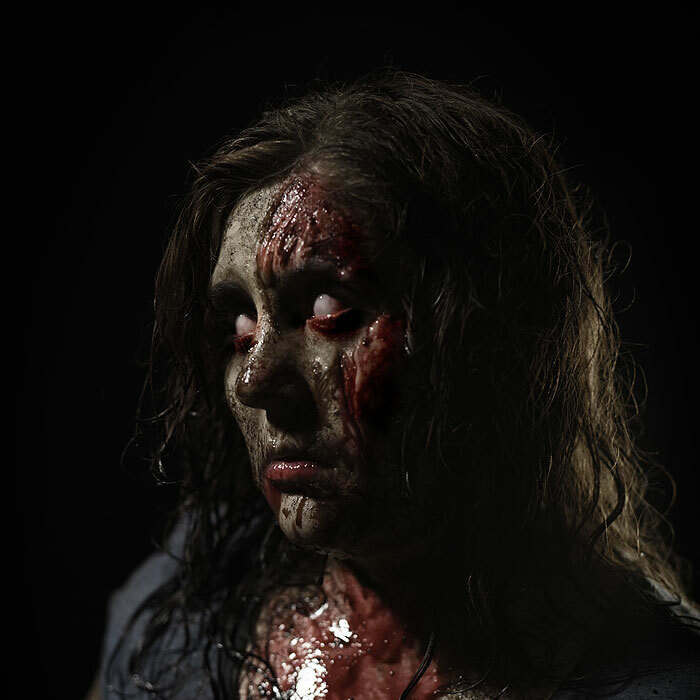 • You will be directed by the photographer into scary poses which will feature a lot of fake blood. As the shoot progresses, more blood will be added. 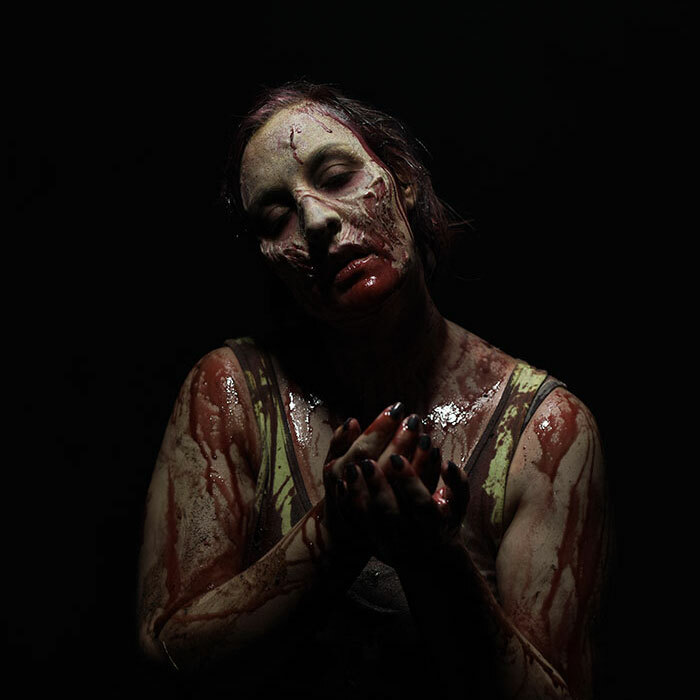 • This is a very gory portrait photoshoot in which you will become the most amazing zombie! The actual shoot is a lot of fun and not scary to do, but the resulting photos are very scary! We'll guide you though a series of poses that show you as a mindless walking corpse. 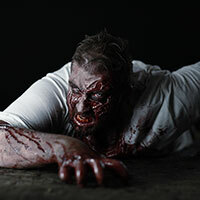 The disturbing snarls and moans of a hungry zombie make very dramatic shots. 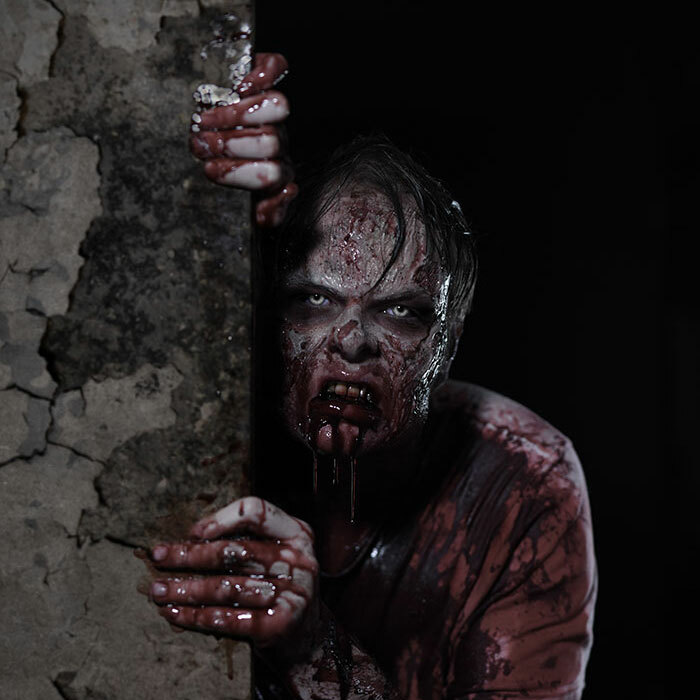 You'll drool and dribble plenty of blood from your mouth as you creep around the set. Our blood is safe and edible. You will be asked to bite flesh, eat guts, and rip into the gore. Don't worry, everything we use is completely harmless and safe and no real meat is used. 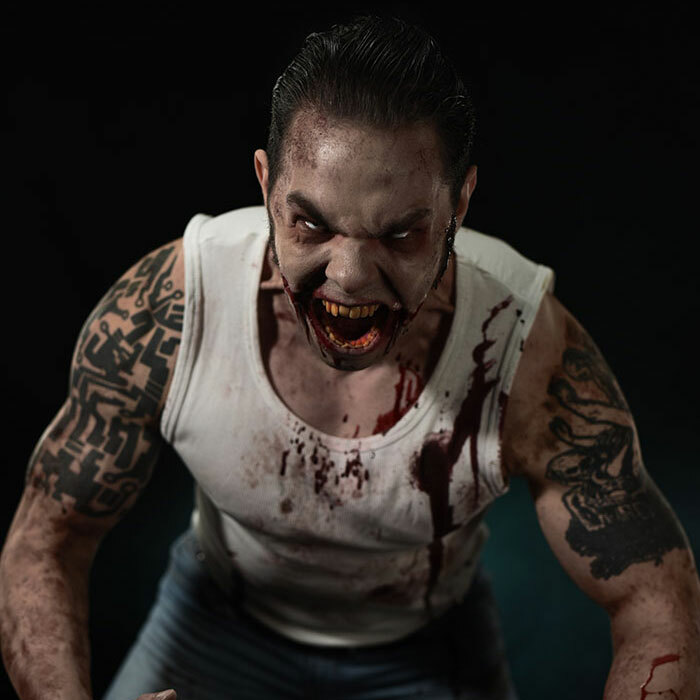 You will get the chance to crawl around snarling your teeth and drooling blood. A maximum of 5 people can do the zombie shoots. What better family portrait can you get? Your children can come to this shoot. 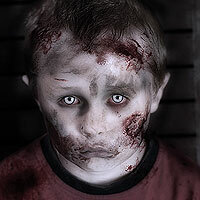 Zombie kids look very creepy! All children must be kept under close supervision at all times. Age 8 and over only. • Old clothes that we can ruin. 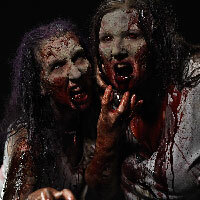 Please try not to arrive wearing your zombie clothes as we will need to cut holes in them and make them filthy prior to the shoot. • Please consider light coloured clothes, rather than dark colours or reds. We want all the blood and gore to really show up so lighter colours work better for this. 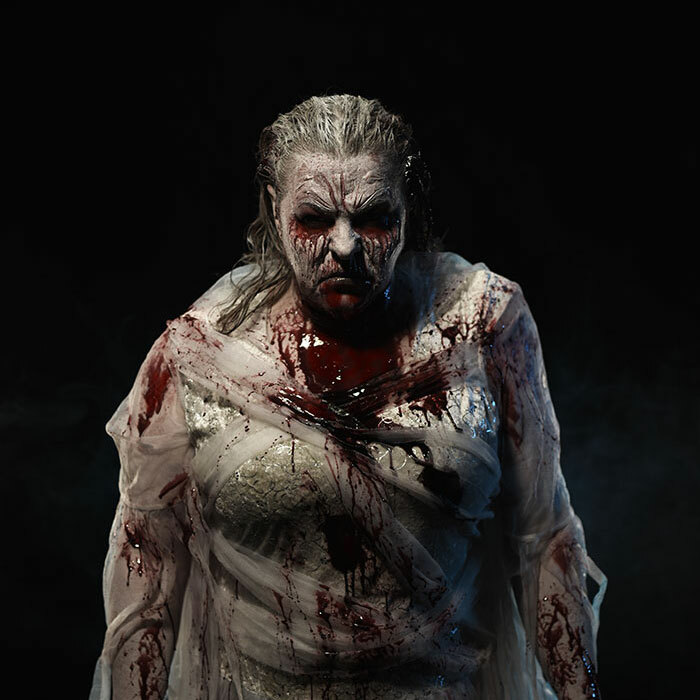 • You can theme your zombie if you like (for example, a zombie clown, zombie nurse etc). • Please keep in mind that whatever clothes or costume you bring may suffer damage or be utterly ruined by the end of the shoot. 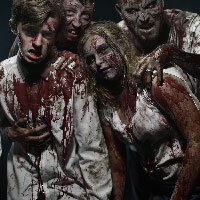 We do zombies properly at Horrify Me! • Age 8 and over. 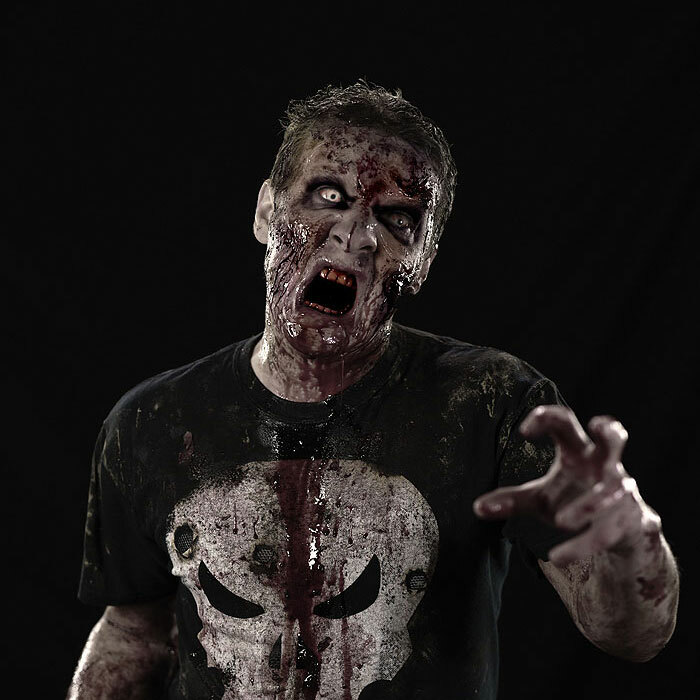 Some children love the messy, fun zombie shoots and the theatrical poses required for the photos. However it won't be for everyone, so please use your best judgement when deciding whether or not to bring a child to this shoot. • If you do bring children then you will be required to sign a consent form. All children under 16 must be accompanied by a parent or responsible adult. All children must be kept under close supervision at all times.